Random: What Ever Happened To The Queen's Golden Wii? Just under a decade ago, publisher THQ released Big Family Games, a Wii title which hoped to follow in the famous footsteps of Wii Sports with its own family-friendly, motion control minigames. If you haven't heard of it before, that's likely because it never reached those high levels of success, but there's a rather comical PR stunt story to be told surrounding it anyway. To spark media interest in the game, THQ supposedly sent a golden Wii console to Elizabeth II, the Queen of the United Kingdom, so that she could enjoy flinging digital horseshoes at chickens in her spare time. Since then, the whereabouts of this special Wii has been largely unknown - especially since you can't just send any old item to the Queen - so where is it now? Easy,the Queen gave the console to Lord Lucan. I didn't know if there was a GOLD Wii. Is that PAL region Only ? Can someone tldr this for me till I get home and can watch? Good thing he got it before Soulja Boy does. @boatie with a collector. the video is great, tho, watch it! Now someone has to track down one of these, if they even still exist. I thought it will be available for purchase. A collector, "Dan", in the Netherlands (Utrecht, specifically). 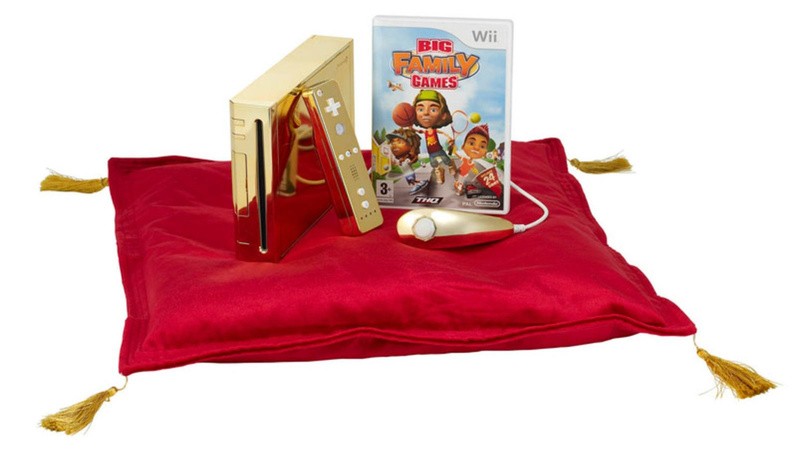 Actually, there was a golden Wii you could buy at some point. Only three made in total and... Well, it's actual gold plating with actual diamonds as buttons on the console. @Kirgo Yes, there's a few people that will make any console gold for the right price. I'll just stick with my golden Wii Remote+ that I got with Skyward Sword. It still sees frequent use. Is it truly gold-plated? Or just painted? If it is gold paint, it seems like it would be very easy to fake... how does the collector know it is authentic? Vinyl (of N64Forever.com)!!! Great collector and extremely knowledge guy!! @holygeez03 If you know the mass of a regular Wii, the mass of the gold plated Wii, the volume the Wii occupies, and the density of gold, then you could probably determine if it is fake gold or real gold. For a fun time, say the title of this article out loud to the next person you see. Enjoy the ensuing hilarity! The queen isn't exactly young anymore. When my Grandmother was that age it was hard enough for her to simply walk or use a TV remote. The Queen looks healthy on TV, but I wonder how much of that is just careful media presentation. Not saying she's gonna die or anything. Just that it would likely be extremely hard, if not almost impossible for her to enjoy motion control games anymore. @Heavyarms55 I mean, she's gonna die. But, regardless, I think you're right. It's one of those... unfortunate facts of life. @nonprophetmusic Well yeah, she is gonna die eventually. But what I meant was, she isn't on her death bed. You'd never see that in America. Here you see consoles for everyone. And stagnating income for the majority. @TheDanslator well now I can’t unhear it .. the article is ruined, I say! @nintendosage Make that 2 Wii Us. I have one as well. Unless you intended that as a joke. I make the golden Wii ever morning. Best Wii of the day! I had no idea lizard people could play computer games. Solid Gold Wii, now I wish him the best of luck with the search for the Solid Gold GBASP. I SO wanna play Goldeneye on that Wii.